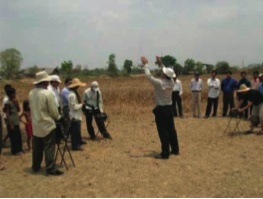 The Department of Land Management and the Department of Urban Planning in Kampong Speu Province in Cambodia was in need for an actual aerial photo for their urban land use planning project. The available black and white aerial photos from 1992 were too old for planning in a fast developing urban area. 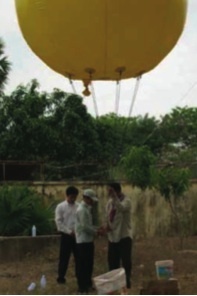 Mr Teng Peng Seang from “Phnom Penh Geoinformatics Education Center” developed a technique to take aerial photos by using a balloon. 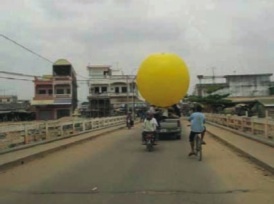 Ded (German Development Service) provided the budget to test this technique for the use in urban planning activities in Cambodia. The result was an georeferenced aerialphoto with a resolution of 0,5 m. On the coloured photo, land use patterns were easy to identify; small huts, single trees, walls and fences were clearly visible. 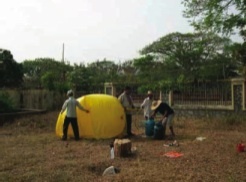 The filling up of the balloon with Hydrogene Gas in the garden of the Provincial Department of Land Management Kompong Speu. The filling procedure needed at least three hours. 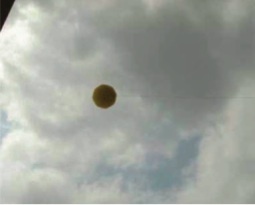 Then the balloon is ready to start. To verify the direction of the wind, a first test start has had been necessary, without the camera equipment. 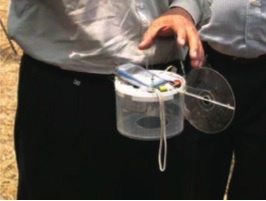 The balloon is controled with three ropes of 1500m length each. The wind direction in 1000m height is not necessarily the same as on the ground. In this case the verified wind direction made a change of the first launch location necessary to ensure the overlight of the project area. The first launch location is fixed, the camera equipment has to be prepared now. Several overflights from different launch locations are necessary to ensure sufficient overlap of the photos and therewith a good quality of the final product. A digital camera is the core piece of the photographic equipment, two mobile phones are used as transmitter and receiver. In the moment the technique is only possible to apply in areas with mobile phone coverage. However, in many cases a simplified description of the step-by-step process is always possible. The balloon is launched the balloon with the camera equipment. The equipment is fixed around 10m below the balloon.The balloon will rise to a height of 1000 m to take vertical air photos. The first aerial photo has been taken by calling the mobile that is releasing the camera. 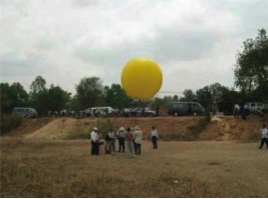 While the balloon is slowly flying across the project area, a large number of photos has to be taken to produce later on one final aerial photo. A number of GPS points have been taken to verify the location on the ground as exactly as possible. Afterwards the aerial photo has been georeferenced to be ready for use in GIS mapping. The orthophots have been reoreferences to known landmarks on topographic maps. Once every single orthophoto is geo-referenced, all photos can be merged into one entire orthophoto. This can be used as a backdrop image for vectorising all relevant unit such as roads, water bodies, housing areas, agricultural areas, forest, administrative areas etc. Finally the Department of Land Management produced a map based on the aerial photo, in order to discuss plans for the future development of the town.